ScaleX.ai today announced the launch of BDR.ai, dedicated to sending personalized emails on behalf of quota carrying sales professionals, so that they can focus on higher value work. The business problem - Less than half of all sales professionals are meeting their quota in today's competitive selling environment. The major reason for a lack of quota achievement is a lack of pipeline. Sales professionals are tired of wasting time researching contacts to reach out to and then sending the same persona based message over and over again, with limited results. According to TOPO, a Research and Advisory firm, a typical sales professional, who is paid to close business, invests up to four hours per day researching and emailing prospects. Chad Burmeister, CEO of ScaleX.ai and BDR.ai said, "After leading a global SDR organization for a top Unified Communications company, I was frustrated to see my SDRs and BDRs investing hours of their time researching contacts and writing personalized emails that led to sub-par open and reply rates." BDR.ai was launched to give quota-carrying sales professionals a low-cost, highly personal way to invest in their own productivity, whether their company reimburses them or not. For $599/month, the sales professional has access to the ScaleX.ai email template library that has been proven over time to have the highest open rates, and reply rates in the industry, delivered by a virtual BDR aligned to the sales professional. 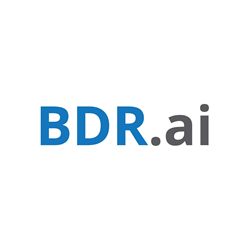 About BDR.ai - BDR.ai is the leader in Automated Business Development for quota-carrying sales professionals. We send personalized emails on behalf of your sales team so that they can focus on higher value work.